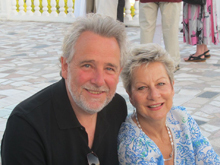 Our Aroma Tours adventures are now complete for 2013 and Robbi and I are very grateful to have shared so many wonderful moments in the company of delightful people from around the world, with new friendships made and old ones rekindled. We are enjoying our home time and catching up with friends but already our thoughts are turning to the upcoming tour season in 2014 which is off to a flying start with Tuscany already fully booked and 5 other tours down to the last few vacancies. What a blessing it for us to be living our passion and to see our dream of sharing the places, people and experiences that we love unfolding each year. We also invite you to take a peek at our Photo Galleries Pages where you will be able to enjoy many more beautiful images of our past adventures. Robbi and I are very excited about our new Flavours of Italy Tour which explores the flavours, character, culture and beauty of northern Tuscany, the magnificent Ligurian coast and Cinque Terre, the gastronomic delights of the Po valley, the rich cultural heritage, fabulous wines and lush vineyards of the Veneto region and the majestic beauty of Italy's most beautiful lake, lake Como. 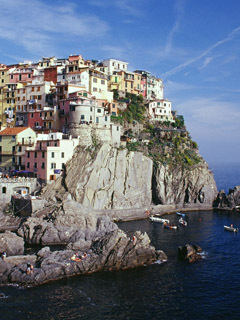 We will visit stunning villas, gorgeous seaside towns and medieval walled cities, witness the birthplace of Ferrari and the creation of gastronomic treasures such as Parmigiano Reggiano and balsamic vinegar, explore fascinating ancient sites and iconic villages perched on majestic mountain lakes. Your will savour wonderful food and wines that celebrate the rich gastronomic traditions of the "Slow Food" movement, all created with skill and passion for you to enjoy in beautiful settings with plenty of time to appreciate the tantalizing contrast of flavours and aromatic delights, from finest gourmet cuisine to delicious traditional fare. Enjoy ripe vineyards, glorious music and fabulous shopping all while soaking up the local character and charm. 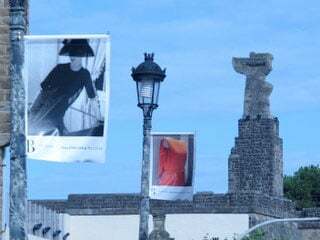 We begin our journey in a lovely boutique hotel right in the centre of a beautiful walled medieval city full of history, culture, colour, antiques, cafes, gracious piazzas and local charm. 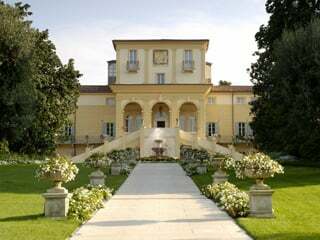 Next we enjoy the delights of a magnificent luxury spa hotel full of world class contemporary art set amongst the lush vines of the Valpolicella followed by a delightful small hotel right on the shores of lake Como with spectacular lake views. Robbi and I look forward to sharing many delightful experiences with you as we explore the flavours, culture and beauty of northern Italy. In all of our journeys we love to share the joy of experiencing the cuisine and gastronomic traditions of the regions we visit. It is a challenge to express the delectable moments we share but hopefully your eyes will enjoy dining along with us. To that end, we have compiled a series of photo pages of the lovely meals we enjoy during our adventures to tantalize your taste buds. Next year's adventures begin with our wonderful Flavours of Spain Tour, a delightful gastronomic pilgrimage that explores the exceptional cuisine, incredible wines, rich culture and sweeping beauty of North Eastern Spain. You will experience enchanting villages, glorious seaside vistas, stunning architecture, lush vineyards, delicious food and wines, colourful markets, ancient abbeys, amazing art, beautiful countryside and fascinating historical visits. We have enjoyed a wonderful season in 2013 with all of our tours once again fully booked and already our 2014 tour season is off to a flying start with an unprecedented number of early bookings, mostly from our returning Aroma Travellers and their friends. IIf the tour you would like to attend becomes fully booked you may like us to add you to that tour's waiting list as sometimes we receive late cancellations or transfers. Frederick Mistral ( 1830 - 1914 ) was born in the tiny village of Maillane in the Bouches du Rhone region of southern France and after a lacklustre early education, he took it upon himself as a young man to champion the independence of Provence, and in particular to restore the first literary language of civilized Europe: the "Langue d'Oc" also known as Occitan or Provencal. Mistral resolved: "to raise, revive in Provence the feeling of race ...; to move this rebirth by the restoration of the natural and historical language of the country ...; to restore the fashion to Provence by the breath and flame of divine poetry". As a consequence of this great work over a lifetime, Mistral was awarded the Nobel Prize for literature in 1904. During his career he redefined the language in its purest form by creating a comprehensive Occitan-French dictionary and transcribing the songs of the medieval troubadours, who spoke the language in its original form. Mistral's most important work is an epic twelve part poem Mireille ( Mireio in Provencal ), published in 1859, which tells the story of the thwarted love of Vincent and Mireille, two young Provencal people of different social means. Mireille's parents wish her to marry a rich landowner, but her heart already belongs to Vincent who is but a lowly basket maker. Sad and desperate, Mireille runs off to Saintes Maries de la Mer at the mouth of the Rhone river and a place of pilgrimage, to pray to the patrons of Provence to change her parents' minds but tragically, she falls victim to the heat, dying in Vincent's arms under the gaze of her parents. Mireio was a literary triumph and as a result it was translated into fifteen European languages and in 1863, French composer Charles Gounod made it into the opera, Mireille. Frederick Mistral became much beloved in Provence for giving literary credibility to the Provencale language and perhaps this resulted in his name being associated with the fierce, cold northerly winds that are typical of Provence or maybe it was just a coincidence, given that Mistral ( Mistrau in Provencale ) means masterly and when Le Mistral blows it certainly masters all before it. 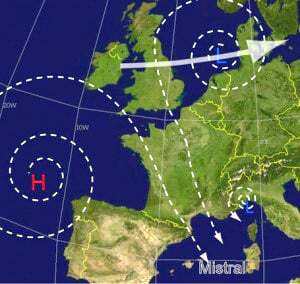 Le Mistral is a cold, mostly dry, regional wind that can reach speeds of more than one hundred kilometres an hour which occurs each time there is an area of high pressure in the Bay of Biscay accompanied by an area of low pressure around the Gulf of Genoa. It occurs mainly during winter and early spring, streaming in from the north or north west, accelerating as it passes through the southern Rhone valley between the Ardeche and the low Alps, before heading out into the Mediterranean to influence the weather in North Africa, Sicily, and across the region. Le Mistral helps explain the unusually sunny climate ( more than 200 days of sunshine a year ) and clarity of the air in Provence. Other parts of France can have cloud and storms, but Provence is rarely affected for long. Le Mistral quickly clears the sky; in less than two hours, the weather can go from overcast to completely clear! Le Mistral also blows away dust and haziness making the air crystal clear, so that it is possible to see distant mountains over 100 kilometres away. It was this clarity of air and light that attracted many French impressionist and post-impressionist artists to the South of France and that gives us that glorious azure that we enjoy during our time in Provence. Few places we have ever visited can match Istanbul as a place of both the exotic and the spectacular. "There God, man, nature and art have created and placed the most magnificent view the human eye can contemplate on earth." 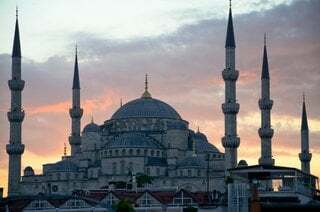 For over 2,500 years the city known today as Istanbul, situated at the meeting place of Europe and Asia, has been a place of great strategic and trade importance. Some of the world's greatest civilizations including the Persian, Byzantine, Greek, Roman and Ottoman empires have left behind them a rich legacy of culture, architecture, art, antiquities and of most interest to us, their aromatic heritage. 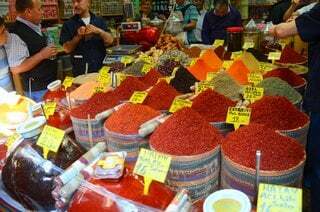 One of our favourite outings in Istanbul is to visit the Spice Bazaar or Misir Charsisi situated near the shores of the Golden Horn. Spices from all parts of Turkey and beyond have been traded in this amazing "L" shaped building since its' construction in 1660 as part of extensions to a nearby complex of mosques. Stall after colourful stall containing all manner of exotic aromas from spices, herbs, gums, perfumes, incense, teas, seeds, nuts, Turkish delight [ scented with rose, lemon or pistachio ], saffron and caviar greet us. In the areas outside of the main building there are even more stalls filled to the brim with all manner of goods that are also wonderful to experience and explore. Istanbul has an abundance of exotic flavours and fragrances to be savoured, and the story of coffee is a great example of its' aromatic influence. Coffee is a native of Ethiopia and was first cultivated by the Ottomans in Yemen for use in Sufi religious ceremonies. The first public coffee house was opened in Constantinople in 1554 and "kaveh", as it was called, quickly became very popular. Europeans were first introduced to coffee outside of Vienna by the Ottomans, who while retreating after their second and final, unsuccessful attempt to lay siege to the city were forced to leave behind sacks of coffee beans. When asked what the sacks of beans were for, one of the captive Ottoman soldiers explained how to roast, grind and brew this strange new beverage. It is interesting to note that the triumphant Austrians decided to celebrate their victory by creating a pastry! They thought it a nice idea to be eating the symbol of the Ottomans, their long time oppressor - the crescent moon. Or as they called it "the croissant". I suppose they had to have something to eat with their cup of coffee!